Preheat the oven to 350 degrees. If your chicken sausage is precooked, slice links into smaller chunks and place in food processor with garlic cloves, milk and pesto. Process until the chicken sausage is broken down into a fine ground and evenly mixed. Combine the chicken sausage mixture with the ground chicken, bread crumbs, parsley, parmesan, cheese, egg, 1 teaspoon salt, and 1/2 teaspoon pepper. If chicken sausage is raw, remove casings and combine with other meatball ingredients. With a teaspoon, roll 1-inch meatballs into a ball and drop onto a sheet pan lined with parchment paper. Bake for 30 minutes, until cooked through and lightly browned. Set aside. To prepare the soup, heat the olive oil over medium-low heat in a large heavy-bottomed dutch oven. Add the onion, carrots, and celery and sauté until softened, about 5 minutes, stirring occasionally. Pour in the chicken stock and wine and bring to a boil. Incorporate the Acini di Pepe and lower the temperature to simmering, cooking the pasta 8-10 minutes, until the pasta is tender. Once the pasta is ready, add the meatballs to the soup and simmer for 1 minute before adding the pesto. Taste for salt and pepper. Stir in the fresh spinach and cook until tender. Ladle into soup bowls and sprinkle each serving with extra grated cheese. 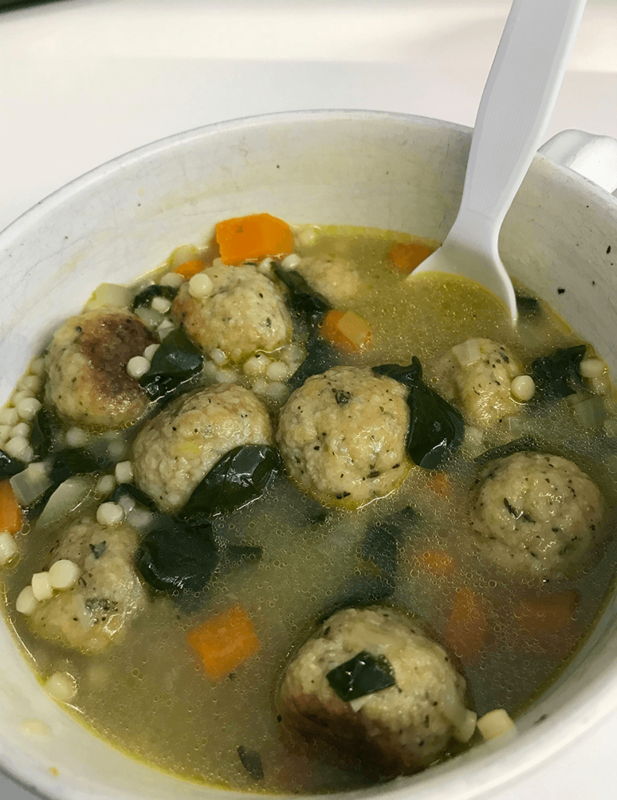 This entry was posted in Recipes and tagged italian, Soup by chrystiewithay. Bookmark the permalink.